Ransom Riggs, author of the NY Times bestselling YA fantasy, Miss Peregrine's Home for Peculiar Children, which is also this book's prequel. After escaping their time-controlled "loop" with their injured leader, Miss Peregrine, Jacob, Emma and the cast of peculiar children (think X-men, only not) must scour the streets of London to find someone to help them. Only problem? The year is 1940 and London's in the midst of the Blitz, and there happen to be hundreds of evil creatures chasing them through the bombed out highways and alleys. Please don't ask me why. I just like it. Miss Peregrine's Home for Peculiar Children, because you need to find out what happens. A Wrinkle in Time, because you like YA adventure books that are written as well as most adult novels. Jacob is a spoiled, troubled rich boy living in Florida, until he flies away to Wales, chasing the stories of his grandfather's childhood. There, he learns he has special (peculiar) talents, and in Hollow City he must put those talents to work to save the woman to whom his life is indebted. Sad, scared, and angry by turn, he's also madly in love with Emma, who adds a bit of spark to his life. Who's young and cute and not annoying? Oh! Thomas Brodie-Sangster, AKA the boy from Love, Actually, and now Jojen Reed in Game of Thrones. He's perfect. London during the Blitz? I'm a total history nerd, especially over anything involving World War II, but living there? Having to send my child away to the country to avoid the bombs? No, I probably don't want to live there. But I'd love to visit! "Then I actually experienced my peculiar ability coming to life. Very quickly, the churning pain in my belly contracted and focused into a single point of pain; and then, in a way I can't fully explain, it became directional, lengthening from a point into a line, from one dimension into two. The line, like a compass needle, pointed diagonally at that faltering spot a hundred yards below and to the left on the mountainside, the waves and shimmers of which began to gather and coalesce into solid black mass, a humanoid thing made from tentacles and shadow, clinging to the rocks." I came into Hollow City with high expectations. Very high expectations. So high, in fact, I didn't think it would even come close to meeting them, and, in a way, I dreaded writing this review. Because you see, though I don't read much YA lit, I loved Miss Peregrine's Home for Peculiar Children. I loved the story, and the way Riggs blended these old, found photos into one cohesive album, illustrating a fun, exciting, original story. And I didn't know how he was going to top it with this sequel. And now I get to say: I was pleasantly surprised by just how much I enjoyed Hollow City, especially given my expectations. It was as well written as Miss Peregrine, and the action was fun, intense, and often creepy, which is just what I like. The characters all stayed pretty true to who they were in the first book, which was great because I loved them all and knew them from the get-go. If I had one critique, it's that the photos don't flow quite as nicely with the story as they did in the first book, but I think it's because of how they all came together. 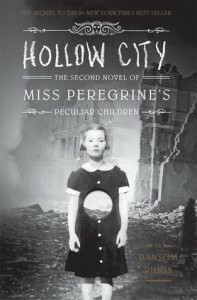 For Miss Peregrine, the photos came first, and essentially wrote the story, but for Hollow City, the story came first. My understanding is that Riggs then had to find photos that worked with the plot points, and while it was mostly still good, I don't think it was quite as seamless this way. But still, they were fun and eerie and lent a pleasant chill-factor to the book overall, especially when I got to a photo of the ONE THING that scares me more than just about anything...but I'll leave it up to you to guess as to which photo it actually was. The ending is very exciting, and full of dreadful things. I won't give you any spoilers, but you do have to read through to the end. I'm already anxious for the third book in the series, but Riggs tweeted just yesterday that it won't be out for a couple of years. So until then, I'll perhaps go back and re-read the first, and flip through the photos anytime I need a jolt of fun in my day. Because that's what these books are to me: a great big jolt of fun.